First up: there are some affiliate links in this post – they help me pay for my hosting costs. If you do buy anything via one of them, thank you! English Paper Piecing and I don’t have a very deep relationship, although I wish we did. So when Carolina Moore asked if I’d like to be part of the blog book tour for her new book Learn How to English Paper Piece, I gave a big “yes”. I was happy for the push to revisit this method of hand sewing and enjoyed reading the digital version of the book provided to me. Carolina’s book is for beginners and was perfect for me. I have a couple of small projects under my belt, so I was keen to read up on the techniques and tips suggested in the book. Why would you want to English Paper Piece? Behold my fussy cut bees. 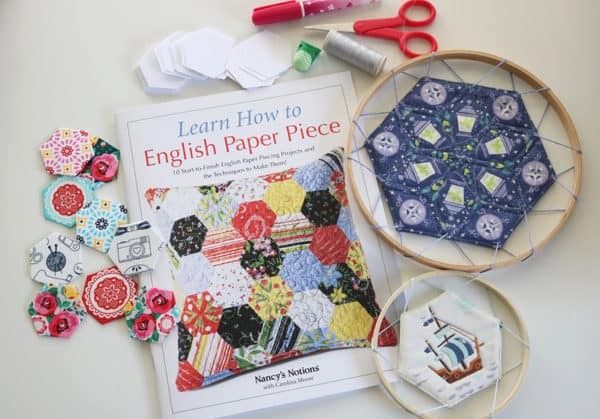 How to get started with English Paper Piecing. Well, buy Carolina’s book! It’s affordable and is a great reference to have at hand when creating your first projects. All the projects are very achievable – so don’t be worried that she’ll have you sewing several hundred shapes. You can start with small items such as coasters and various pouches, and build up to a cushion or quilt. As far as tools – I always believe it’s best to use what you have on hand when you first start. If you find English Paper Piecing agrees with you then you might like to upgrade to a few of these to make the experience even more enjoyable. Milliner’s needles are great for EPP – most people like to use size 9, but this pack is handy as it lets you find the size that suits you best. Thin thread will give you more delicate stitches, which is always nice with handwork. Plenty of folks swear by this thread weight, but I actually prefer this one as I like to use a doubled-over length of thread (to avoid starting knots). In most cases, a light silver or dove grey colour thread works well to blend in with multiple colour fabrics. 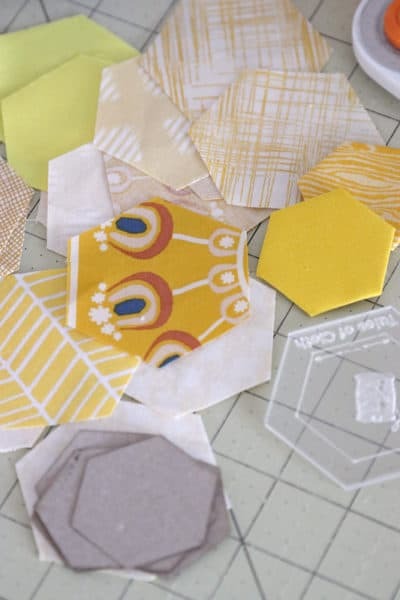 You can cut your own English Paper Piecing templates, but if you’d like to buy some ready made you can find a wonderful selection in Jodi’s shop, called Tales of Cloth (Australian, but she ships internationally). I’ve tried her papers and an acrylic template – both top notch. And of course, Amazon might have something suitable. I was tempted by many of the smaller projects in the book (I like how the projects are all items that I’d actually use or would make thoughtful gifts). But I settled on the zipper pouch because I knew my daughter needed a new pencil case. 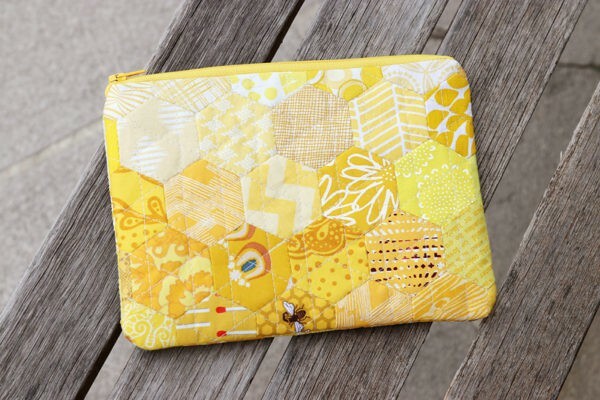 I have a ton of yellow scraps from all the yellow quilts I’ve made her, so I had plenty of fabric to choose from. 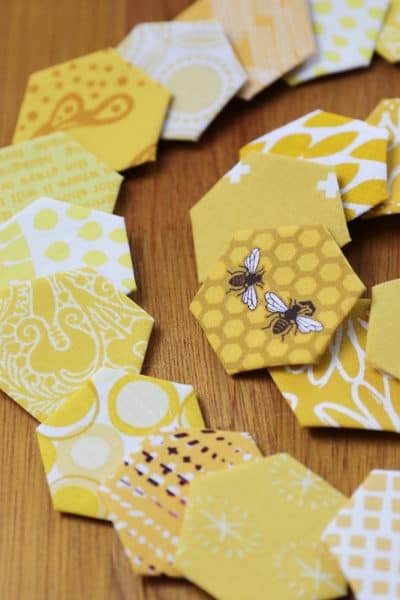 If you don’t have a well developed scrap collection yet, here are some very pretty, colour-coordinated scrap options. I very much enjoyed hand sewing it all together while listening to the lessons of an online course I’d purchased. I find EPP is the perfect “something to occupy my hands” that doesn’t take away my capacity to listen well. The zipper pouch sewing part went very quickly once the hand sewing was complete. My daughter chose the lining (a solid forest green) as she loved the contrast. I would never have thought of that, so it was fun to put those two colours together (although hard to photograph). I’m really happy with my little EPP project and so is my girl! Saturday, January 26th: Linda from Linda B Creative and Havalah from Sisters, What! 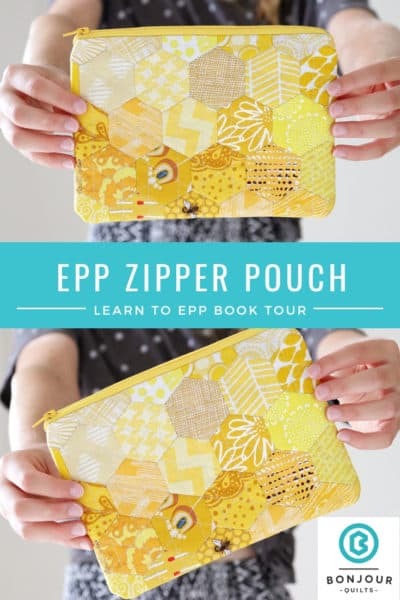 So what do you think – are you up for some EPP? If you’re already a seasoned English Paper Piecer, please do pass on your favourite tips. I’m all ears! If you’re looking for information on how to machine appliqué EPP (or anything for that matter) to your quilt, you’re in the right place! 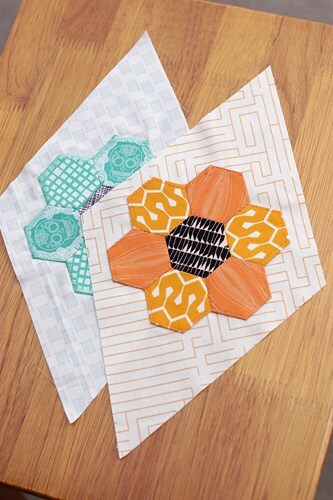 Today I have a tutorial on how to machine appliqué some pretty little EPP hexagon flowers to a quilt block background. Hello and welcome to those participating in the Kingfisher Stitch-Along! “What is the Kingfisher Stitch-Along?” I hear my regular readers ask. It’s a joint project hosted by Rachel from Stitched in Color and Jodi from Tales of Cloth, to sew the beautiful Kingfisher quilt. This quilt combines hand pieced English Paper Pieced (EPP) blooms, appliquéd (by hand or machine) to a background fabric, with machine pieced diamonds. 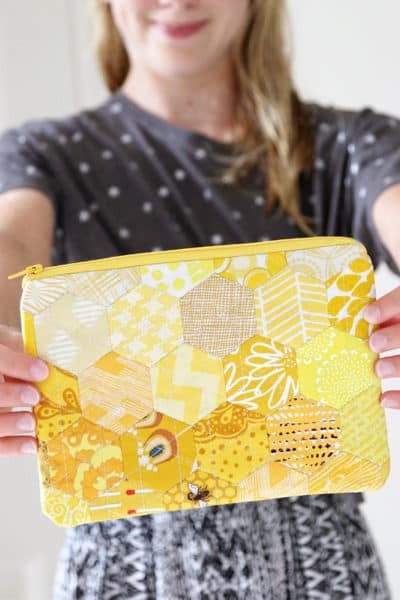 I think you’ll agree the result is one scrapalicious and gorgeous quilt! You can head over to Jodi’s online store to get all the templates and EPP papers you might need. She has a great kit which has papers and acrylic templates for the two shapes in the quilt. By this stage of making your Kingfisher Quilt you should have a bunch of EPP blooms and some background diamonds to sew them to. You can find Rachel’s tutorial on how to cut your diamonds here. 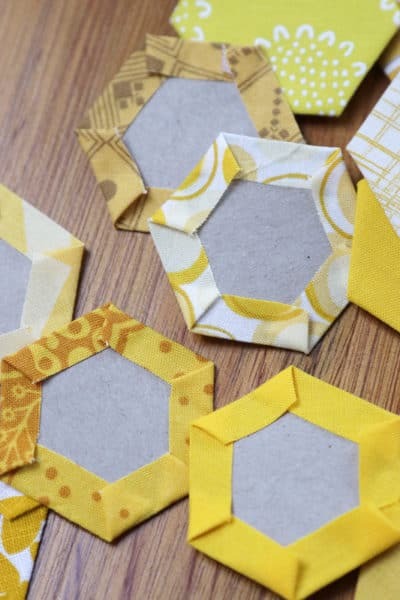 Before you start make sure you’ve taken the EPP papers out of all the hexigons in your EPP blooms and trim any threads that might extend outside the edges of your EPP (if you glue basted your hexi shapes this is unlikely to be an issue). Next, fold your background diamond in half from point to point, on both axes and finger press. This is just to give you an easy way to centre your EPP bloom on the diamond prior to machine appliqué. To fix your bloom to the background, ready for machine sewing, you can either use pins or double-sided fusible web*. I had no problems at all using pins, but if you’re really nervous about the machine appliqué process then you might prefer to use the fusible web. It’s very secure and you won’t have to worry about pricking your fingers. Just follow the instructions on the product to adhere the fusible to your bloom and then to fuse the bloom, centred, to the background diamond. If pinning, make sure your pins aren’t too close to the EPP edges – you don’t want them to interfere with your sewing machine foot as you sew around the edges. If you have an open toe sewing foot you will want to use it here. Much like how a night out is more fun wearing an open toe sandal, machine appliqué is a much more enjoyable experience with an open toe foot as you can better see what you’re doing. The great thing about EPP is that the edges are already turned under so there are no raw edges to contend with. You can pretty much use any stitch you like to secure it to your background as long as you sew it close enough to the edge to secure the two fabric layers (the shape and the folded under edge). For this example I’m just using a regular straight stitch for my machine appliqué. I like to start sewing midway along an edge. Start with a few backstitches to secure your thread, or if you’re lucky enough to have a machine with a securing stitch, use that. Then start sewing, slowly, towards your first corner. I have seen some folks comment that they’re a little concerned about stretching the bias edges of their background diamonds. While you’re guiding your EPP/diamonds under your sewing needle, don’t grab the diamonds by their edges. Rest your hands on the outer edges of your EPP and use that if you need to give direction. But really, because we’re sewing in straight lines rather than curves there’s not a lot of need to push your pieces around under the needle. At most you’ll just need a bit of course correction. My other tip is to sew slowly – this will negate the need for sudden, panicked movements. Slow and steady wins the race! Alright, so we’re sewing our first edge, heading toward a corner. If you’re sewing toward a corner where two EPP pieces meet, you should aim to land your needle down exactly where they meet. Then lift your sewing foot and pivot the piece until your foot is in line with the next edge. 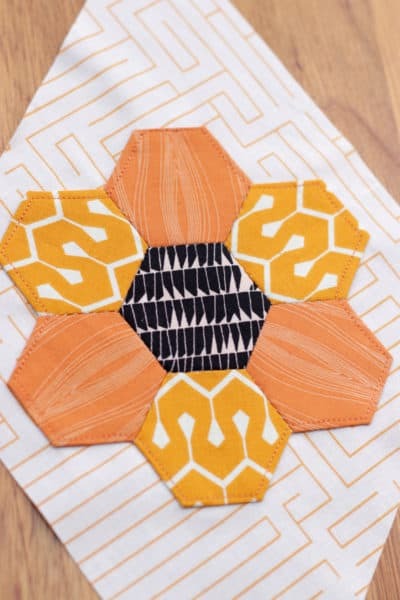 If you’re sewing toward an outer corner on a hexie, just eyeball it and stop a seam-distance away from the upcoming edge. If you’re a perfectionist then by all means feel free to mark where you want to stop with a water soluble* or air soluble* pen before you get to that corner. Pivot and continue on your way. Continue around the whole of the bloom until you get back to when you started. I recommend going past your start point 5 or so stitches, backstitch to secure and then cut your threads. You now have a machine appliquéd EPP flower. You will see that above that my seams are by no means perfectly even. Once all my diamonds are sewn together this will be very hard to detect, so I urge you not to get to per-finicky as you’re sewing. When you are focussing on a very small area it can feel like a millimetre difference is as big as a quarter inch. It really isn’t, and it really won’t be noticeable if you’ve stopped a bit early or late on a corner. As well as using standard straight stitches, machine appliqué is an opportunity to experiment with some of the fancier stitches on your machine. For my next bloom I chose an irregular edge satin stitch (I have a Janome 8900QCP and it’s stitch #54). I would definitely recommend a test drive when using a decorative stitch. It’s important to figure out how the needle swings when forming the stitch so you know where you want your needle to be when you stop for corner pivots. I just use some plain hexi shapes when doing a practice, I don’t bother with using complete EPP units. Once I have an understanding of the stitch pattern and where I need to put my needle down I can then go on to sew my real pieces. Then pivot the piece, lower the foot and sew the next line. For an inner corner, you stop where the pieces join and when your needle is over to the right. What I will say with the wider decorative stitches is to make sure you go slow where your EPP is closest to the edge of the diamond. The wider stitches have a tendency to “grab” at the fabric and pull it into a little pucker within the stitch itself. Just take your time on the EPP edges closes to the edge of the diamond and you’ll be fine. Once you have your EPP appliquéd to your diamonds it’s best to sew them together into a quilt top as soon as possible. This will protect the bias edges from stretching with excess handling. If you can’t sew them up straight away, make sure they’re stored in a box or container of some sort so you can just move the box around rather than picking them all up and stressing their edges. If you have any questions (or tips to pass on) be sure to pop a comment below. Some snapshots from one of my works in progress: a queen sized quilt for ME (and I guess my husband can use it too). After a rough start I am really enjoying how it’s coming together. 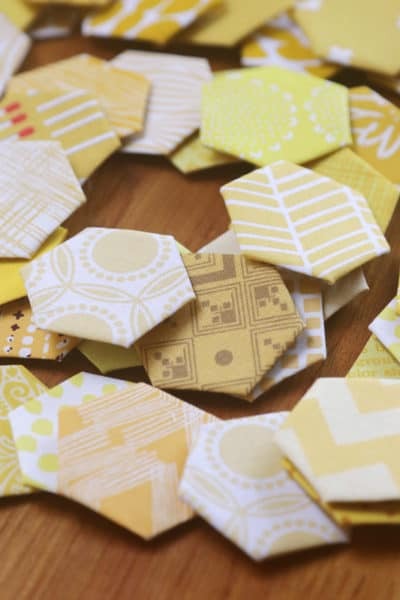 Linking up with Lee’s WIP Wednesday at Freshly Pieced. Hope you’re all having some luck with your WIPs too!